Menlo Park, CA, February 20, 2018 - WeVideo today announced that its top-rated video editing app, already recognized as a Google Editors' Choice and Top Developer, has been awarded by Google as an Android Excellence App. This program, curated by Google Play editors and developers, recognizes the top performing Android apps. It highlights select apps such as WeVideo which have been optimized to provide the highest levels of performance on Android, are noteworthy for adopting the latest Android features, and deliver the best overall experiences on Android devices. WeVideo works in close collaboration with Google to fully optimize its app for all Android devices, including the latest Chromebooks running native Android. 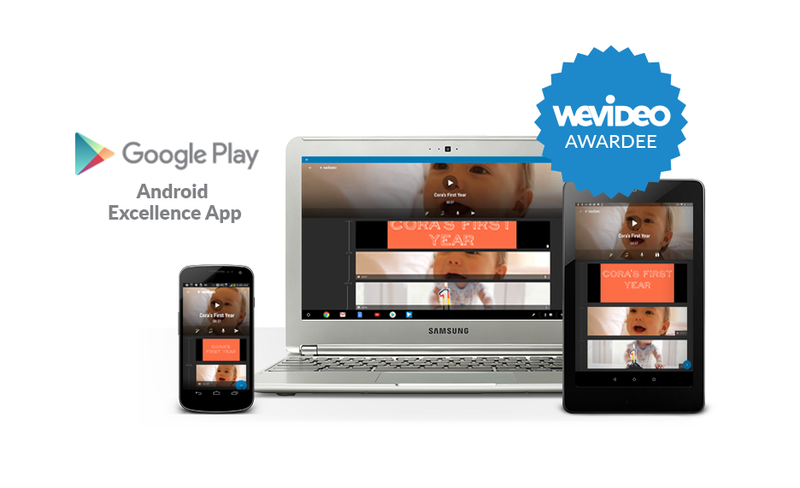 WeVideo can easily be found on the Google Play Editors' Choice page under Android Excellence Apps. The WeVideo video editor app has been downloaded more than 9.5 million times and has maintained an enthusiastic 4+ star rating from Android users for several years. WeVideo President Andrew Baum said, "Delivering a great experience across all platforms is central to our mission. We work very closely with Google to take full advantage of the technical and performance advances in Android to quickly deliver a fun, easy-to-use video creation tool that lets people create and share amazing movies for fun, work, school and all facets of life." The WeVideo app for Android offers a tremendous creative palette for video editing, graphics, special effects, and more. It is the perfect tool for making and sharing videos on YouTube, Facebook, Twitter, Instagram, and more. It is also the gateway to WeVideo's web app, powered by the cloud, which gives every user the power of a world-class editing workstation, anytime, anywhere. Share finished projects to social media including Facebook, YouTube, and Twitter. Videos can also be streamed from the web or saved offline to watch on TVs, projectors and other devices. Upgrading to a WeVideo mobilepass account, just $3.99 for one year, unlocks additional, high-value features including expanded music and theme libraries, as well as watermark/bumper-free publishing. WeVideo also offers flexible individual subscription options that combine the complete premium Android app experience and WeVideo's full-featured web-based application, with exclusive features such as motion titles, for use on Chromebooks, laptops and desktops, starting at just $4.99/month. Every WeVideo subscription includes a deep suite of video editing and creative tools, cloud storage, and much more, with support for browsers as well as mobile apps on Android and iOS. A subscription plan makes it easy to access WeVideo projects anywhere, at any time, on any device via the cloud-based WeVideo web app. WeVideo also offers uniquely featured and specially priced Education and Business subscriptions.